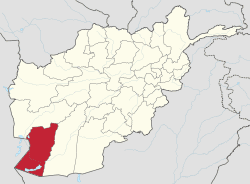 Nimruz (Balochi/Persian: ولایت نیمروز‎‎; Pashto: نيمروز ولايت‎) is one of the 34 provinces of Afghanistan, located in the southwestern part of the country. It lays to the east of the Sistan and Baluchestan Province of Iran and north of Balochistan, Pakistan. The province contains five districts, encompassing about 649 villages, and roughly 156,600 settled people. The city of Zaranj serves as the provincial capital and Zaranj Airport, which is located by that city, serves as a domestic airport for the province. The name Nimruz means "mid-day" or "half-day" in Persian and Balochi. The name is believed to indicate that the meridian cutting the old world in half passes through this region. Nimruz covers 41,000 km². It is the most sparsely populated province in the country, located in the Sistan Basin. A substantial part of the province is the desert area of Dashti Margo. Following US-led invasion in October 2001, the Taliban began losing control of the province to the new Afghan government under President Hamid Karzai. The area is historically known for drugs and weapons smuggling between Afghanistan, Iran and Pakistan. Many foreign militants also use the province to go back and forth between the 3 nations. The Delaram–Zaranj Highway was built by the Indian government in 2009, which is one of the main trade route of the country and is expected to boost the socio economic development in the province. Since 2002, members of the U.S. Marine Corps were present in the province. When the International Security Assistance Force (ISAF) arrived to Kandahar, Nimruz province became part of the Regional Command Southwest. The local Afghan National Security Forces (ANSF) are being trained by these forces. ISAF is also involved in development activities. The current governor is Mohammad Samiullah. His predecessor was Amir Muhammad Akhundzada. All law enforcement activities throughout the province are managed by the Afghan National Police (ANP). The borders with neighboring Iran and Pakistan are monitored by the Afghan Border Police (ABP). A provincial police chief is assigned to lead both the ANP and the ABP. The Police Chief represents the Ministry of the Interior in Kabull. The ANP and ABP are backed by the military, including the NATO-led forces. The overall literacy rate (6+ years of age) increased from 22% in 2005 to 23% in 2011. The overall net enrolment rate (6–13 years of age) increased from 33% in 2005 to 49% in 2011. The population of Nimruz Province is approximately 156,600 settled people. 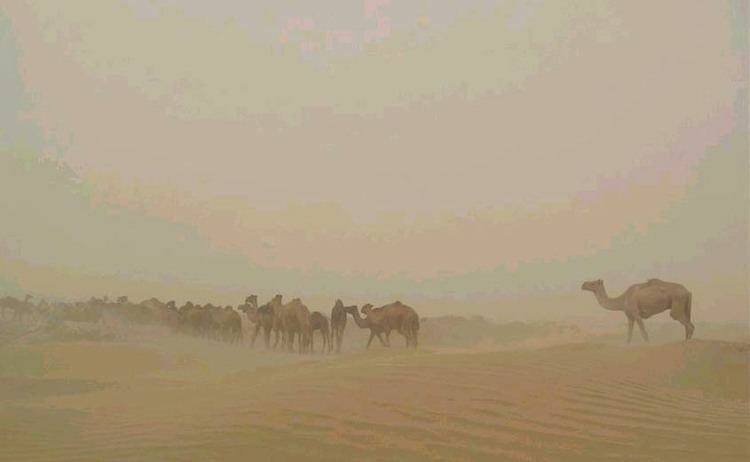 There are also many Kuchi nomads who inhabit the province seasonally. The Baloch ethnic group form majority in the province followed by Pashtun, Brahui, Tajik, Uzbek, and Hazara. The Pashtun tribes are mostly Barakzai and Nurzai. Almost all inhabitants except Hazaras follow Sunni Islam. Languages spoken in the province are Pashto, Dari, and Balochi, which is spoken by the Baloch tribes as their mother tongue.